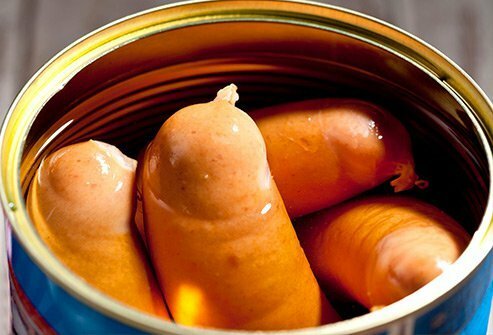 Why Is Processed Meat Dangerous? Processed meats are smoked, cured, salted, canned, dried, or preserved. Cold cuts, hot dogs, bacon, sausage, salami, beef jerky, ham, corned beef, and other processed meats are linked to a variety of health problems. In several studies, people who ate the most processed meat had higher rates of diabetes, heart disease, and some types of cancer. Excess salt, preservatives, and fat in the products are to blame. Eat more meatless meals, cut back on the amount of processed meats you eat, and up your intake of fruit and veggies to protect your health. 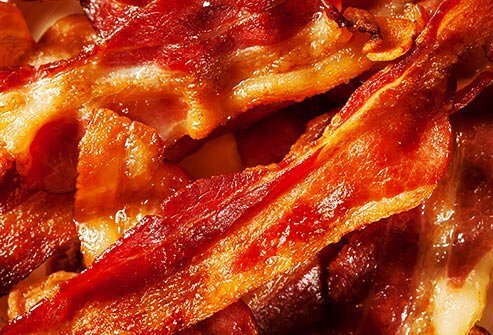 Eating bacon increases the risk of both diabetes and coronary heart disease (CHD). In one study, eating bacon and hot dogs was associated with a relatively higher CHD risk compared to eating other subtypes of processed meat. High salt content may be one culprit. Dangerous compounds called nitrates may also be to blame. The high fat content of the processed meat is bad for your heart and your waistline. Skip it altogether or choose leaner cuts of meat to indulge in instead. 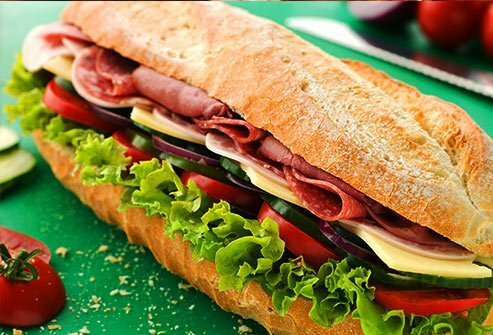 Sliced ham, beef, chicken, and turkey cold cuts that are preserved with salt, sugar, seasonings, and other chemical preservatives are a frequent sandwich filling. High intake of these products with unhealthy additives is associated with a greater risk of colorectal cancer. 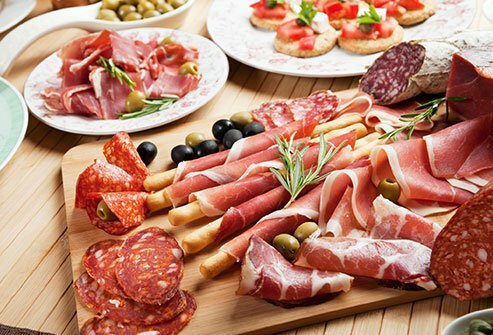 Choose natural sliced meats without nitrates and preservatives. Choose low- or no sodium varieties to keep your salt intake down. It's ok to indulge natural, preservative free sliced meats occasionally, but do not eat they every day. 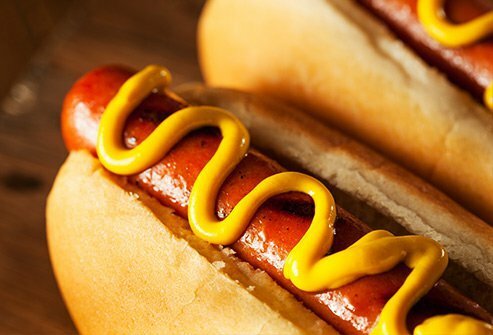 Hot dogs are a frequent fixture at sports games, barbecues, and picnics, but consuming this all-American food comes with some serious health risks. Eating this type of meat is associated with higher risks of diabetes and CHD. It is also associated with higher rates of colorectal cancer. Which bad guys are to blame? Salt, nitrates, nitrites, and saturated fat in these processed meats increase these health risks. Grilled kebobs made from fresh meat and veggies make healthier barbecue and picnic fare. 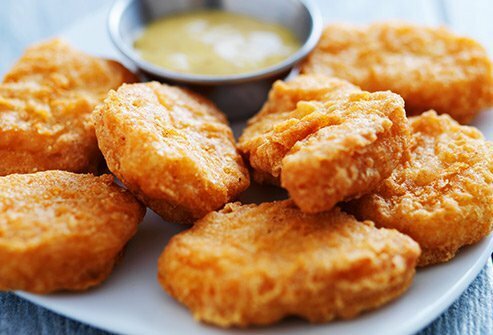 Fast food chicken nuggets may be the ultimate processed meat. Lab analysis found these bite-sized nuggets are comprised mostly of chicken bones, epithelium, nerves, connective tissue, and meat. Chicken meat is not the primary ingredient in fast food chicken nuggets! A better option: Cut up fresh poultry into bite sized pieces. Coat them with a mixture of bread crumbs, spices, and eggs before baking. They taste amazing and the best part is that you won't be consuming any mystery ingredients! Is Beef Jerky a Good Option? 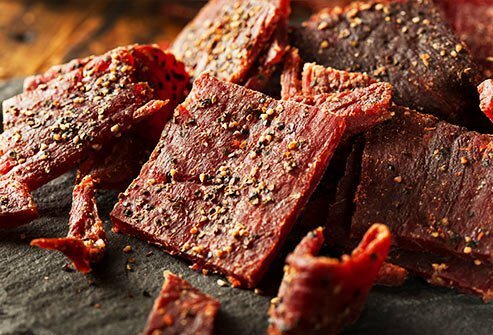 Beef jerky is a cured, dried meat that is appealing because it is so portable. However, the sodium, preservatives, sugar, and saturated fat make it unhealthy. Low-quality, cheap jerky is most likely to contain additives that are most harmful to your health. If you are going to indulge, choose high-quality jerky that does not contain nitrates, nitrites, and that is low in fat and does not contain sugar. It is still a processed meat so it's best to indulge in jerky occasionally and not every day. The International Agency for Research on Cancer (IARC), an agency of the World Health Organization, has classified both red meat and processed meat as carcinogenic. 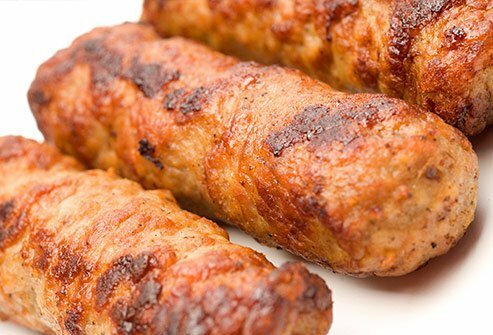 In studies, people who ate more of these meat products had higher rates of colorectal and pancreatic cancer. 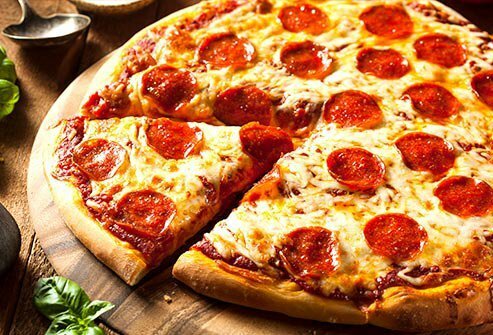 Pepperoni is a much-loved pizza topping but it's a meat that is processed. It is full of sodium, sugar, preservatives, saturated fat, and calories. Pepperoni undergoes fermentation, or curing, within its casing. This processing gives the meat a tangy flavor and a chewy texture, but the product may be dangerous because of all the unhealthy additives. Choose pizza toppings like fresh tomatoes, basil, artichokes, olives, garlic, and other fresh veggies that actually have health benefits. Pesto makes a tasty pizza topping instead of cheese and processed meats which are high in saturated fat. Is Breakfast Sausage a Good Morning Option? 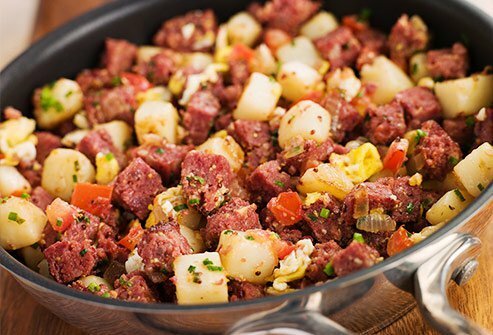 Breakfast sausage and patties are a common morning accompaniment to eggs and pancakes, but these favorites are loaded with sodium, fat, and preservatives. Thankfully, healthier breakfast meat options are available that do not have these unhealthy additives. Lean chicken, turkey, and vegetarian sausage are great alternatives. Top them with a tangy salsa if they need a bit of a kick. There are plenty of creative ways to flavor plain meats without adding extra sodium, fat, and calories. Pancetta is pork belly that is preserved with sodium. It is not smoked like some other processed meats. Smoking meat increases cancer risk. Pancetta is high in fat and calories. Most varieties contain some preservatives, spices, and is air dried. Because of the additives, it is best to enjoy pancetta occasionally. If you want to use a substitute for pancetta in recipes, bacon- or pork-flavored tofu is a good option. You can also use a bit of marinated chicken breast, jerky, or minced meat. 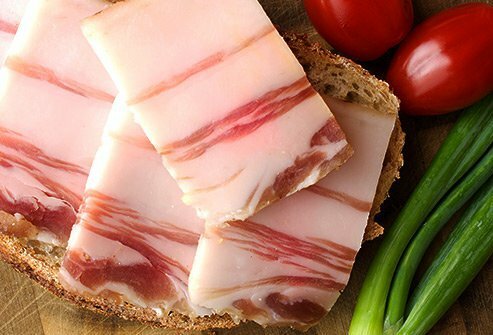 Thin slices of ham make a good substitute for pancetta. Fast food hamburgers are often made from lower-quality meat from cows that have been raised and treated with antibiotics and growth hormones. The patties are often high in saturated fat, sodium, and preservatives. 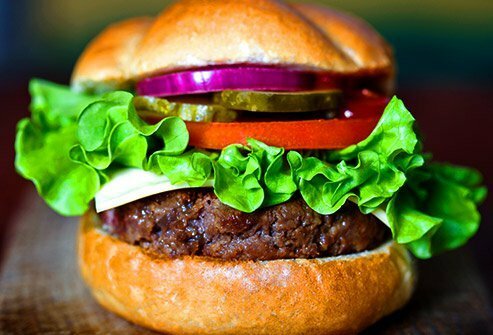 It is much better and healthier to make your own hamburgers at home using lean, USDA 100% organic beef or turkey. Red meat is still red meat. In general, it is best to limit your intake of red meat to no more than once per week as red meet in excess is cancer-causing. In studies, consumption of processed meat and alcohol have been linked to higher rates of stomach cancer. Deviled ham is sold in cans that you can find in the supermarket. It often is high in sodium and preservatives like sodium nitrate. You can make a much healthier version at home using cooked ham, mayo, mustard, onions, and hot sauce. The recipe is a good way to use leftover ham and create a new dish. 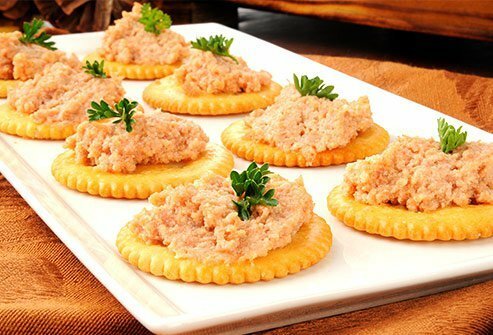 Homemade deviled ham makes a satisfying sandwich filling or it is great served on top of crackers. Vienna sausages are tiny sausages that are often made from spiced chicken, pork, and beef. The meat is ground into a fine paste and loaded into casings. They may be smoked or not before cooking. After cooking the casings are removed. The products also tend to be high in sodium. All in all, they are highly processed and it is best to not consume them often, if at all. This canned processed meat is typically brisket that has lots of sodium and has been cured. It has lots of grams of fat and preservatives. A healthier option is to eat fresh lean red meat. You can also make a more heart friendly version with bell peppers, potatoes, white onion, and turkey pastrami. Top the dish with some fried eggs to make a complete breakfast. USDA: “Bacon and Food Safety," "Jerky and Food Safety."